The employee absence schedule 2014 template is a simple-to-use tool that allows for easy record keeping of employees. It tracks each employees time off from vacation hours that they have used to medical hours that they used. This easy to use template is a true time saver for those who have to supervise the coming and going of employees. First, download the template under its original name in a location on the computer that is easy to find. Second, open the template and fill in the information under each heading. Under employee name click on the first box and it will automatically populate the name, or lack of a name, in what looks like a browser bar at the top, but is called the formula bar. Here the name can be changed or entered into the template. Once the name is correct in the template click on the tab key and this will place the cursor on that employees vacation hours. Just like the name field the vacation hours can be changed in the formula bar at the top. The same can be done for the employees medical hours. Tabbing all the way to the right of the template will allow you to enter in the company name and the supervisors name. The DATA tab on the bottom of the template is for a list of all employees. Totals can be added and changed under this tab as well. Last, save the file to an easy to access place on the computer. To do this click on the big round circle on the top left of the template and click save. Be sure to update the employee absence schedule 2014 template each and every time information has changed for it. If an employee calls in sick or uses a vacation day it is easy to change the information inside of the template. Always make additional copies of the saved template for security purposes, and for a back up in case anything happens to the machine in which it has been saved on. 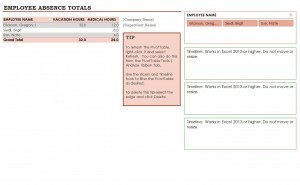 Remember that the employee absence schedule 2014 template is completely customizable to add and subtract any information within it with ease.